Tomorrow the British Championships Men’s Foil trophy recently won by Sheffield Buccaneers favourite fencer Husayn Rosowsky will be visiting our club. This is a very fine and large trophy with names of winners going back to 1898. We will be taking photos of club fencers with the trophy. Husayn Makes ‘Cookie Crumble’ and Wins the British Foil Championships!!!! 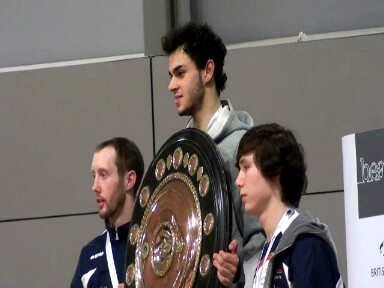 On Sunday 12th December 2011 Sheffield Buccaneers favorite fencer Husayn Rosowsky won the British Men’s Foil Championships at the EIS in Sheffield. In the round of pools he unfortunately injured his ankle whilst fencing Kola Abidogun, this had to be attended to and strapped up but despite this he won all his bouts including beating Richard Kruse 5-2. We gave consideration to withdrawing after the pools but after checking the ankle over again it was decided to continue. Ahmed Rosowsky also fenced and won all his bouts in the pool round, despite having done very little training recently (on meeting Ahmed, Richard Kruse noticed that he had put on a bit of weight and commented “what’s this, the heavy weight division”, I couldn’t possibly comment…ha ha). Nathan Doherty fenced in his first Senior British Championships, won one bout AND scored two hits on Laurence Halsted (in his spiderman mask). After the pools Ahmed was ranked 8th, Husayn 9th and Nathan 62nd. There was a rather severe 25% cut before the Direct Elimination stage which meant that Nathan got cut, though finishing 62 in such a significant and strong event is a good result for Nathan. On the Saturday in the Men’s Epee Sam Boyle finished 61st, winning 2 bouts in the pools and avoiding the cut, this again was a respectable result for Sam. Also on Saturday Rowena Johnson fenced in the Women’s foil finishing 39th. In the last 32 Ahmed was drawn against Alex Tofalides and scored with a succession of strong attacks and despite doing too many counter-attacks won the bout 15-13. Husayn drew Alex Robinson and then Paul Stanbridge to get to the last 16. In the last 16 Husayn and Ahmed drew each other with Husayn eventually winning 15-12, I am sure Ahmed was not so despondent at his loss as it meant that ‘the family’ had a place in the last 8. Ahmed was finally placed 11th. In the last 8 Husayn’s opponent was Amol Rattan whom he had defeated over a year ago in the final of the British Junior Championships, and this time to he won comfortably at 15-6. The Semi-Final match was with Marcus Mepstead who had just defeated Richard Kruse. Husayn got off to a good start and built up an early lead, part way into the bout Marcus collapsed with cramp in his leg which severely limited his movement for the rest of the bout, there was some discussion with the referees as Marcus had had an injury break for cramp earlier in the competition and as a fencer is not allowed more injury breaks for the same injury, there was a discussion over where the previous cramp was in the same place; however, there was a long break. As Husayn was nursing his injured ankle he didn’t want to be attacking and left Marcus to try and make the running eventually winning 14-8. In the final Husayn was against last year’s winner Keith Cook and after a brilliant display of fencing from both fencers Husayn steadily built up a lead to win 15-12. A young Sheffield Buccaneers fencer watching the event made the comment “Husayn makes a Cookie Crumble” ha ha! quite good that. I was very pleased to see that it was Keith and Husayn in the final, both exiting fencers, fast, energetic and with surprising variety in technique. Keith has worked hard to demonstrate that his rightful place is amongst the select few at the top of British fencing, two successive British Championship Finals makes a point for Keith. For Husayn too, this result following on from the previous weekend’s victory at the Leon Paul Cup, his performance at the Olympic Test Event and his 6th place over the Summer in the World Student Games in China and years of top National and International results, surely shows that he’s the man to be watching for the future. Husayn began fencing at the age of 7 with myself and Sheffield Buccaneers Fencing Club and right from that time till now he wanted nothing more than to fence, following the example of his brothers Yasin and Ahmed. My thought from the start was that Husayn had all the prospects of going to the very top, most especially back then, I was thinking Cadet World Championships, where he eventually won a bronze medal. As a 7 year old, through seeing his brothers, he understood what fencing was and wasn’t thinking about ‘pirate fighting’ like other 7 year olds, so it was possible to give focused coaching straight away, his parents could not have been more supportive, and of course he was very motivated and talented. I well remember the early frustration he felt when he was too young for any of the competitions as he went to watch his brothers, and the disappointment he felt on going to watch his brothers at a local competition only to find that an impromptu Under 10s event had also been organized and he didn’t have his kit with him so couldn’t take part. His first National Title was to become British Under 10s Champion and from then until now he has typically trained at least 2 or 3 times a week with competitions most weekends. There is no doubt that Husayn has far more to offer, he has shown himself capable of competing against the best in the world and will without doubt show this more and more. Husayn Rosowsky is the man to watch for the future!